Yet another city often bypassed in my history (mostly during family vacations when I was a wee tot) was the city of Pittsburgh. It's sad (and joyous) to say that my first actual trip just recently happened, as I had a long weekend to spend in town with friends, enjoying some baseball and local sights. Of course, coffee stops made the list of attractions and there were quite a few. Much like Pittsburgh has been one of the few old industrial cities of the America to really bounce back, it seems their coffee scene has also been atypical in the number of acclaimed coffee places to have emerged. My first stop was a relative newcomer to the scene called Voluto Coffee. Located in the Friendship area of Pittsburgh, the cafe is part of a residential building, with Voluto trumpeting huge windows and a nice array of modern-esque outside seating. On the other side of the glass, the cafe continues the modern look, with a gorgeous array of furniture in an 'honest architecture' space. The coffee comes all the way from British Columbia via 49th Parallel. I had myself an espresso (49th's Epic) and a cup from their pump pot (I believe it was french pressed originally) of the 123 degree W Longitude blend. The espresso, pulled short with beautiful crema, displayed notes of vanilla, strawberry, cream, lemon and sugar. The barista did a great job with the extraction and the bright espresso was delightful to slurp. The 123 degree W Longitude blend produced a light, grassy, tart apple coffee with hints of tobacco, orange and honey; a great coffee throughout. The tea was free leaf. As the first cafe on my expedition, I was greatly pleased with Voluto. Stop in. 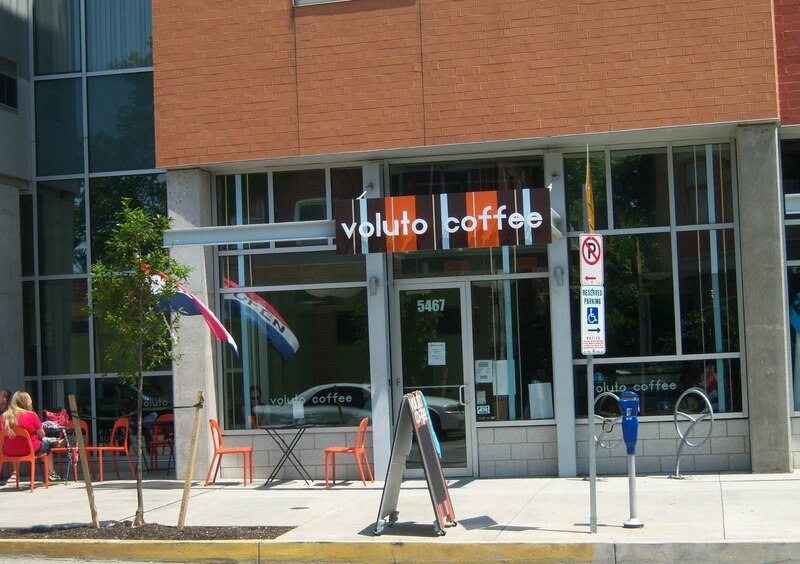 Voluto is now a location for Commonplace Coffee. Still a win as for quality. where is this place? sounds very nice. i love coffee! Ive always enjoyed going to various coffee houses. I particularly like some the ones around missoula, montana. The atmosphere in them can be great especially if theyre using the right coffee mugs. That place looks nice. I wish I could travel the nation and find the best little coffee shops...perhaps travel channel would be interested?